You hold your breath a lot during “Onegin,” the three-act season opener that had only a week-long run at San Francisco Ballet. Those white-knuckle moments come during any number of spectacular lifts the late choreographer John Cranko devised for the principals in this dark tale of love nipped in the bud and then revived, only to be nipped anew. The tension they create – it’s hard not to worry about the prima ballerina’s fragility as her premier danseur hoists her over his head and then parades around the stage – coincides with the concern for the emotional frailty of Tatiana as she slips dangerously into an obsessive love for the insouciant Onegin. If only that tension could have been sustained throughout this otherwise unnatural and rote pastiche that purports to dramatize the internal conflicts of the main characters of Tchaikovsky’s opera “Eugene Onegin,” then perhaps it might have achieved some sense of the Russian spirit of a tragic, broken love and its unhappy consequences that permeate not only the opera but also the verse novel by Pushkin on which it is based. (It’s a melancholy tale of a jaded bourgeois, Onegin, who rebuffs a romantic provincial girl, only to desire her when she is a woman transformed years later.) But the version the San Francisco Ballet offered as a company premiere is sadly lacking in the artistic cohesion such an undertaking requires; it is nothing if not a spectacle, with little emotional depth and a surfeit of artifice, including an overblown restaging by Jane Bourne (the go-to gal for Cranko’s work; she’s choreologist at Stuttgart Ballet and has set this work on diverse companies many times). Also credited (blamed?) is Reid Anderson, the Stuttgart Ballet artistic director whom Cranko mentored. The lack of intimacy is compounded by oversized sets by Santo Loquasto (imported from the National Ballet of Canada’s 2010 production). Cranko, justifiably acclaimed for transforming the Stuttgart Ballet into a company of international standing back in the 1960s, would likely have grimaced at how little of the emotional underpinnings of his work remain in this staging, which seems underrehearsed from a casting point of view, in spite of all of its surface grandeur. 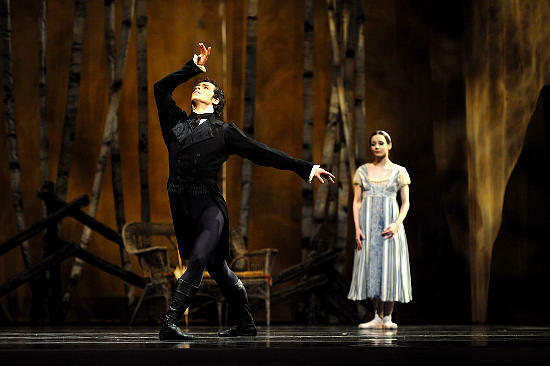 At the Feb. 1 performance, Davit Karapetyan and Vanessa Zahorian carried off the evening with precision and sufficient believability as Onegin and Tatiana (though for all his technical dexterity and lightness, Karapetyan lacks subtlety as an actor, his arched eyebrow and folded-arm defiance bordering on melodrama). They have an appealing ease with each other and make a visually striking couple, if for no other reason than he is exceptionally handsome and she a beauty in her own right. (The three other principal couples in the short run included Vitor Luiz and Maria Kotchetkova, Pierre-Francois Vilanoba and Sarah Van Patten, and Rubén Martín Cintas and Yuan Yuan Tan.) Karapetyan/Zahorian’s execution of the mirror pas de deux in Act I was fairly sensational, comprised of those nerve-wracking lifts and some extraordinarily challenging flips and athletic embraces. But the young Taras Domitro, as Onegin’s idealistic poet friend Lensky, made a mess of his partnering with Dana Genshaft (as Olga, his betrothed and sister of Tatiana). Though Genshaft, a tad long in the tooth for ingenue roles, cunningly portrayed the youthful fiancée with a knowing smile, she did her best to look unruffled by Domitro’s stiff arms and unsure hands around her waist. The young Domitro (he’s barely 25) has always looked more accomplished in his solo work, and that held true in Act II, when he got to show off his admirable jetés and bouncy footwork. But this somewhat unseasoned performer needs more time as an ensemble player before claiming the limelight. Speaking of ensemble, most of big numbers were weighted down by their own grandiosity. Between dramatic scenes featuring the principals, a parade of happy Russian peasants arrives, dancing their hearts out. They are matched (or, more precisely, one-upped) by the various townsfolk and other inhabitants of the provinces, many of them representing elderly folk and made to perform in a stilted, stagey way to telegraph old age. These can’t hold a torch to the palace scenes from Act III for ostentatious, uninteresting choreography, however; it’s a wonder Bourne hasn’t seen fit to drop most of the court dances and their repetitive pomposity. These presentational distractions presumably enable the audience to reflect upon the intimate drama involving the main characters, but they feel tacked on, much as Kurt-Heinz Stolze’s orchestration of various Tchaikovsky works (including bits from the ballet “Romeo and Juliet,” though not, oddly, the opera “Eugene Onegin”) don’t really add up to a coherent whole, either. David LaMarche nevertheless kept the musicians from going astray with so many tempi going on.